When meetings draw employees away from day-to-day tasks but fail to reach their intended outcome, it has huge costs to the organization. All too often, this happens because meetings lack purpose or are simply boring. 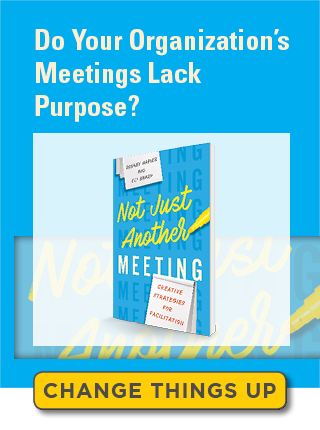 If you’re looking for a way to create a fresh, intentional approach to meetings, check out these videos created by Rod Napier and Eli Sharp, authors of Not Just Another Meeting. Each video outlines a specific way to design a meeting that will not only engage attendees but make the meeting more productive. Applying to wide-ranging workplace issues, these designs provide the tools to enable any gathering to solve problems, build trust, and deal with conflict. What’s more, by expanding your repertoire of what to do and how to do it, you can respond to any situation with calm, certainty, and creativity. This is a simple, yet creative design for engaging up to 30 people in problem solving by seeking their answers to as many as six challenging questions. The Collapsing Consensus is an effective design for collecting and organizing ideas from a group that cleverly ensures a high degree of engagement from participants. This meeting design is based on one undeniable fact: the more people feel engaged in their organizations, the better their performance will be with productivity, morale, and profit. It helps to increase engagement with people and high-level managers. This design presents an adaptable and creative means of solving a problem, while dramatically reducing the possibility of conflict in a group. Kings, Queens, and Fairy Tales is creative design to assess problems, have some fun, and begin the problem-solving process. This meeting design is a safe way to ask for and receive feedback in a group setting. Getting to the heart of an issue is difficult when you don’t have all the facts. This meeting design is great for getting the truth on the table.